Harald Nielsen is legendary Danish striker. He was promising centre forward who had fantastic beginning of his career <b>but unfortunately he was ruined by injuries and move to FC Inter who bought him just to make their rivals weaker and kept him intentionally on the bench to ruin his career.</b>Harald was very explosive player with immense speed in the first couple of meters, very agile and skillful to turn quickly in the box and score, real player of the box with solid shooting and quick reactions, always movin in right direction to receive passes. Although he was pretty lazy, didn't like to move a lot on the pitch which led to confontations with his coaches. Harald Nielsen started as a footballer in Frederikshavn fi and had since he was quite young the goal of becoming a professional footballer. HN debuted on the Danish ynglingelandshold in 1958 , and the second best Danish series of Frederikshavn 15th in March 1959 . HN was the row's top scorer , Frederikshavn moved up , and HN debuted on the Danish national team 13th September 1959 against Norway in Oslo . HN scored a single goal in his debut and he is still the youngest Danish national team player ever. He was only 17 years and 322 days old when he debuted. Harald Nielsen debuted in the top Danish series against Manchester City Above the 20th in March 1960 . Frederikshavn won 3-1 and HN scored all three goals. The success continued throughout the year. Frederikshavn was No. 5, and HN was top scorer in the first division (similar to the current Superliga ). In the summer of 1960 won the national team - called the team silver - silver medals at the Olympics in Rome , and became the tournament's top scorer HN. The term 'Gold-Harald' arose in connection with this tournament, because HN both before and during the tournament Troels maintained that Denmark would win gold. The year after, HN voted Footballer of the Year Denmark in new competition launched by the newspaper News. In 1961 Harald Nielsen came to Bologna in Italy , where he became Italian champion in 1964 and league top scorer in both 1963 and 1964 . After six seasons in Bologna HN changed in 1967 to Inter for a overgangssum of 2 ½ million. DKK, which made him the most expensive footballer time in the world. HN did not have the same success here as he had done during the time in Bologna. 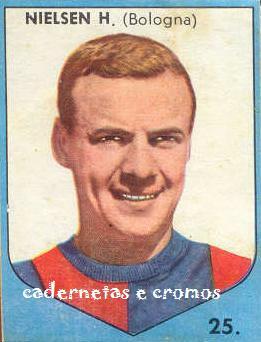 Harald Nielsen also came to play for Napoli and Sampdoria , before he in 1970 ended his career. Since DBU before 1971 not recognized professional footballers, was Harald Nielsen excluded from the national team when he traveled to Bologna in 1961 . HN managed to play 14 matches and scoring 15 goals - despite the fact that he was not the age of 19 when he was excluded from the national team. After being stopped as an active footballer started Harald Nielsen, a company that imports Italian leather goods for Scandinavia . HN tried in 1970 to persuade DBU to introduce professional football in Denmark, and when he had no luck with it, he tried in 1977 together with Helge Sander to create an alternative professional league Danish professional football . It failed, but it shook DBU so much that introduced professional football in Denmark from 1978 . In the early 1990s was Harald Nielsen helped start the football club, FC Copenhagen , where he was chairman during the period 1992 - 1997 , and then an ordinary member of the Board until October 2006. Harald Nielsen starred in 1961 in the movie Father of four with full music , and he married in 1963 to actor Rudi Hansen , who played the role of Mie in all Father of four films.